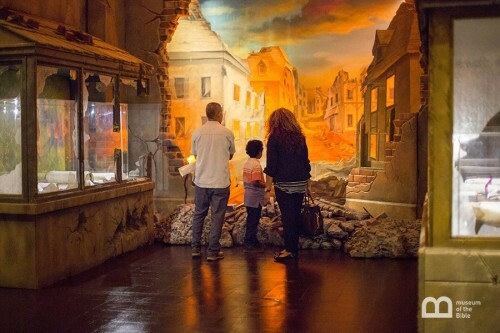 Visitors explore the past in one of the galleries from the Museum of the Bible’s “Passages” traveling exhibit. In 2009, Steve Green purchased his first biblical artifact, the Rosebery Rolle. It was a medieval translation of the Old Testament’s Psalms into Middle English. At the time, Green, who is president of the Hobby Lobby retail chain, had no idea his purchase would lead to what would become one of the world’s largest private collections of rare biblical artifacts and manuscripts. 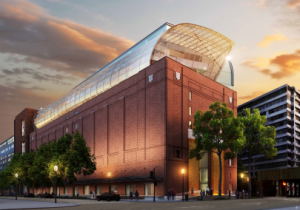 It would also inspire the design and construction of a new permanent home for items in the collection – the Museum of the Bible. A rendering of the exterior of the Museum of the Bible, scheduled to open in Washington, D.C. in November of 2017. Museum officials estimate it will take a guest nine days at eight hours a day to read every exhibit placard, see every artifact, and experience every activity in the permanent museum. Many items from the collection of more than 40,000 biblical artifacts will be on display at the International Convention of The Gideons, as part of a traveling exhibit of the Museum of the Bible. It will be one of several traveling exhibits touring the world during construction of the museum’s 430,000 square-foot, eight-story permanent facility in Washington D.C. In addition to seeing the actual artifacts on display, guests who tour the traveling exhibit will be treated to an immersive storytelling environment and interactive kiosks. 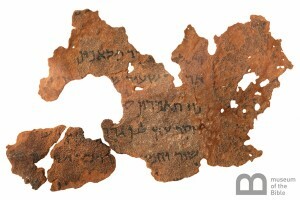 This Dead Sea Scrolls fragment of Genesis 32 is dated at early to mid 1st century B.C. It is just one of the rare Biblical artifacts in the 40,000-plus piece Museum of the Bible collection. The collection features some of the rarest and most significant Biblical texts and artifacts ever discovered. Dead Sea Scroll fragments, Biblical papyri and manuscripts, Torah scrolls, and rare printed Bibles are among the highlights of the museum’s collection. Cary Summers, who serves as the museum’s president, says the exhibit on display at the Convention in Indianapolis will feature international artifacts and other collectible items related to the Bible, as well as items from the USA. Summers, who has been a member of The Gideons International for over 35 years, believes Gideons and Auxiliary from all over the globe will be inspired by the exhibit’s vast collection. Summers points out that few people realize just how far-reaching the Bible’s influence goes. The influence of the Scriptures can be seen in the founding principles of many hospitals, educational institutions, and even justice systems. “We’re trying to show the influence of the Bible globally, and how it’s impacted nearly every aspect of life, in ways people don’t even realize,” says Summers. To date, more than a half-million guests have toured the museum’s traveling exhibits which have been on display in cities from Jerusalem to Los Angeles. Currently, the museum is on display in northern California, Cuba and Germany. Another exhibit is in development that will travel throughout six countries in Asia. This is an “eye opener” for sure. May many people be challenged to search God’s Holy Word for truth and the free gift of salvation. I’m now President of Gideon International Fort Portal Camp. We had problems in attending the Blitz in Hoima and Masindi but praise the Lord that it took place. Part of the problem is that we are very poorly remunerated in this country and its difficult to meet all the expenses for this event but it is good that other Gideons took part in it and this gives us the ability to continue in this noble cause. Next post: How Does God’s Word Get Into Prisons?